The title really has nothing to do with anything, but it was a line in the middle of a not very funny joke Bri told tonight and so much fuss was made over "my buns are burning" that I had to use it as the title of this entry. What a fun day it was! Yesterday was football day. Today was softball day. We went to the softball field around 1 and first watched Brianna's game. 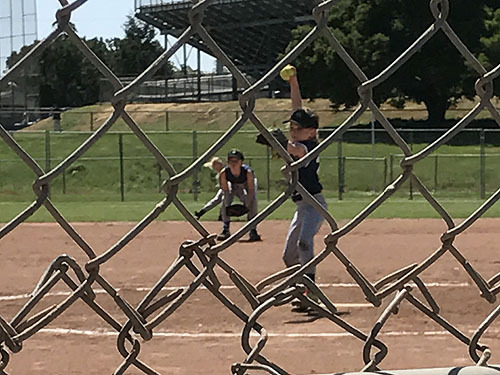 She was starting pitcher and really throws a mean ball. 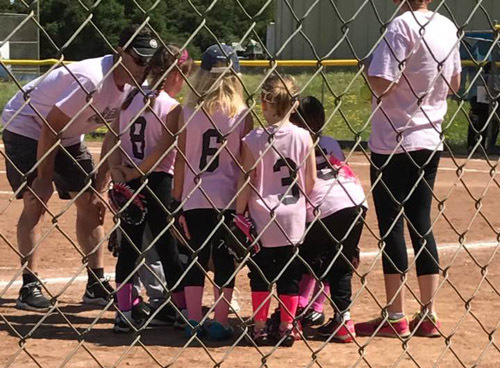 When it was her first "at bat," she hit a single and ran like the wind. I couldn't believe how fast she ran in comparison to the other kids. Laurel said they had her in a track program for awhile, but four sports activities (she is also in karate) was too much, so they had to drop it. We have been coming to her games for 3 years now and I was very impressed at how the girls have improved. This was a real game, with pitching and fielding and being able to catch the ball. I don't have a clue what the score was, but the girls comported themselves very well. 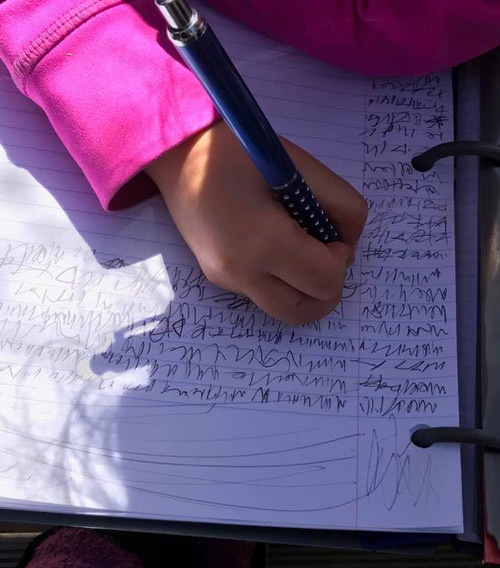 Laurel is the scorekeeper and Lacie has her own book where she keeps score too. She's very diligent about it! Tom agreed with my assessment about how the girls' abilities had improved and said that they were better players, but the girls on Lacie's team were cuter. And they were. Poor Tom had flown in from Boston the day before, but missed his connecting flight from SF to Santa Barbara by literally seconds, and United would not let him on the plane, so he had to rent a car and drive home, arriving at 4 a.m., so he could coach Lacie's team. He is such a fantastic dad. Sports are not Lacie's thing. She plays softball like Ferdinand the Bull, standing there looking at butterflies (or whatever) while the plays go on around her. 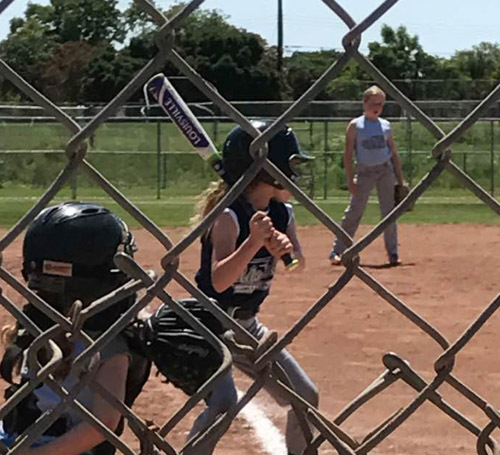 However, she did get on base every time and ran home every time. 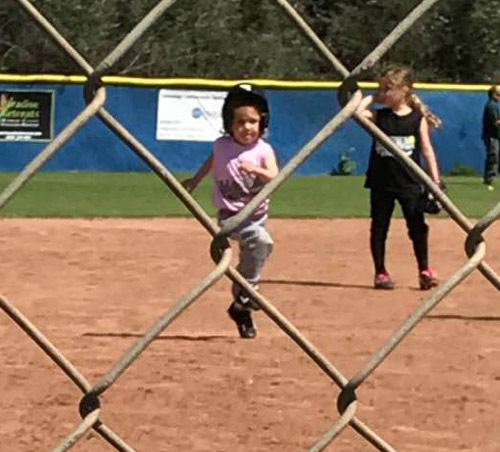 Here she is running for 3rd base. In the evening we went to Tom and Laurel's for dinner and to visit with the kids. 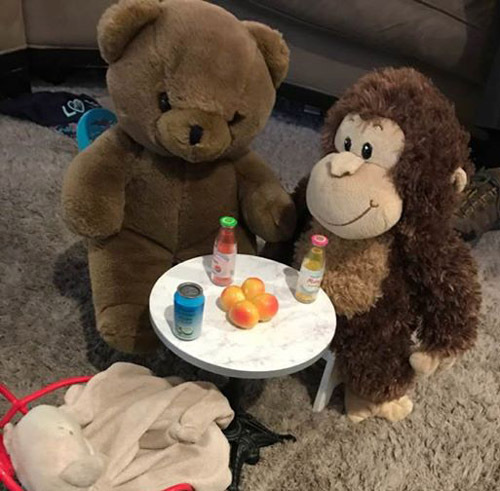 It was also to be the Big Meeting between Benny and Gasper, who have been pen pals for weeks. It went well. They got along well and will be writing to each other again. Bri's birthday was last week and Laurel made an incredible Hogwarts cake for the Harry Potter themed party. She said that now that Bri has learned how to Google, she printed off page after page after page of hundreds of ideas for Hogworts cakes! 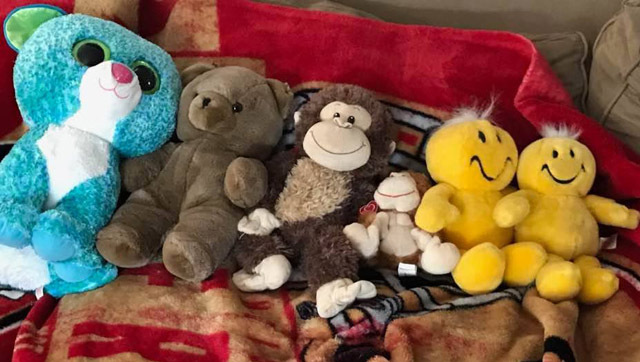 Later, when the girls were getting a little rambunctious with the stuffies, Laurel put on one of their favorite programs -- Master Chef Junior, which I also watch, and we watched the whole episode, talking about our favorite cooks. They really are growing up and we can have more in-depth conversations now. Dinner was delicious and Bri kept us entertained with jokes while Lacie insisted we tell scary stories. How angry I was with myself for forgetting Bri's birthday present in Davis, which is a story-telling game that would have been just perfect! We left early so Tom could get some sleep. I had to come back after we got to the car because I had left my cane behind. Tom answered the door and I told him I had left my cane., "You've never said that to me before, Mom" he said! One of our best visits here since we've had grandchildren.